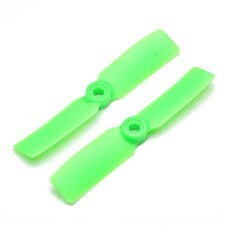 These bullnose propellers are 5x4.5 / 5050 and are made from green nylon, they are supplied as a pair, one CW and one CCW. The bullnose propellers are made from tough nylon which are great to deliver the motor power and thrust, they do this by a reduction in efficiency over traditional propellers. The slight loss in efficiency is an accepted loss due to the advantage these props give in performance while FPV racing. The 5 x 4.5 inch prop size is suitable for use on First Person View racing Drones that take a 5045 sized propeller. The centre mounting hole is 5mm on the hubs of these propellers.